The Northshire Mystery and Thriller Reading Group will meet on Thursday April 17th at 2pm in the bookstore conference room for a discussion of The Boy in the Suitcase by Lene Kaaberbol and Agnete Friis. Lene Kaaberbøl and Agnete Friis will sign and discuss Invisible Murder (Soho $25). Lene Kaaberbøl and Agnete Friis are the Danish duo behind the Nina Borg series. Friis is a journalist by training, while Kaaberbøl has been a professional writer since the age of 15, with more than 2 million books sold worldwide. Their first collaboration, The Boy in the Suitcase, was a New York Times and USA Today bestseller, and has been translated into 27 languages. Lene Kaaberbol Agnete Friis A number of the MG staff in both locations, including Linda, are among the international fans who thrilled to The Boy in the Suitcase, The first crime novel from Danish authors Lene Kaaberbøl and Agnete Friis. In Invisible Murder, Copenhagen Red Cross Nurse Nina Borg once again finds herself in a conflict between family and others in need, as she investigates the source of illness in a local camp of Hungarian refugees. Make sure to check out our great selection of other titles from Soho Crime at our South Bay Galleria kiosk during October! Lene Kaaberbøl discusses Talk about her writing. Lene Kaaberbøl was born in Copenhagen, Denmark, and grew up in the small town of Malling, in the Jutland countryside south of Aarhus. She published her first book when she was only 15 years old. It was the first book of what became the "Tina" children's fantasy series, which has never been translated from Danish. She graduated from Aarhus Katedralskole and earned a degree in both English and drama from Aarhus University. In 1988, her first fantasy novel for adults, The Morning Land, appeared. In addition to writing, she has also worked as a high school teacher and a translator. With Agnete Friis, a journalist, she is co-author of the Nina Borg series, beginning with The Boy in the Suitcase (2011), a bestseller. Lene Kaaberbøl's book A Lady in Shadows was available from LibraryThing Early Reviewers. 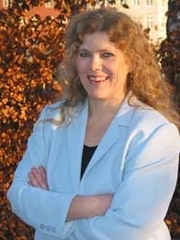 Lene Kaaberbøl is currently considered a "single author." If one or more works are by a distinct, homonymous authors, go ahead and split the author. Lene Kaaberbøl is composed of 19 names. You can examine and separate out names.